Today we’re going to help dress an iconic symbol of holiday cheer, cold weather and children’s songs everywhere; you guessed it, a teapot! Hot drinks are something I have always associated with the weather turning and the holidays coming up. Not just tea, but cider, hot chocolate, coffee; coming in from playing in the snow and having a steaming cup of something waiting for me. I can hear the wind whispering at the window already. 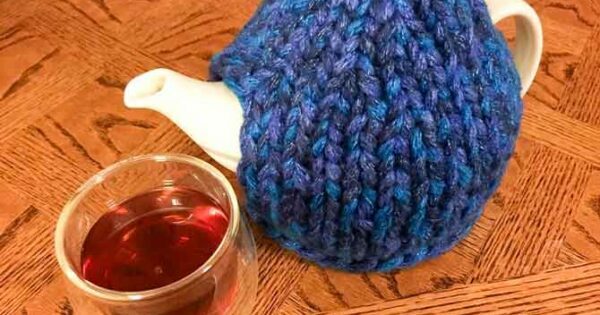 For this pattern you can use the technique we went over yesterday to get the gauge specific to your particular teapot. The model used is 16 inches around and 5 inches tall. Every teapot is going to have a slightly different handle and spout placement as well. Measure from the lowest point on either the handle or the spout, straight down to the table. You’re going to use this measurement as how many rows you need to knit plain at the very beginning. Feeling cozier already with the casting on. CO 30 stitches, join in the round, place marker at the beginning of the row and the middle of the row; close to 15 stitches in if you’re going by the measurements for the teapot I used. Knit three rounds plain. Now, you’re essentially going to make something of a big button hole for the handle and the spout. From your beginning of round marker, turn your work, slip the first stitch purl-wise and purl back to the other marker, which should be placed directly opposite your first marker. Measure the length of the handle on your teapot. Just where the top of the handle and the bottom of the handle are connected to the pot itself. 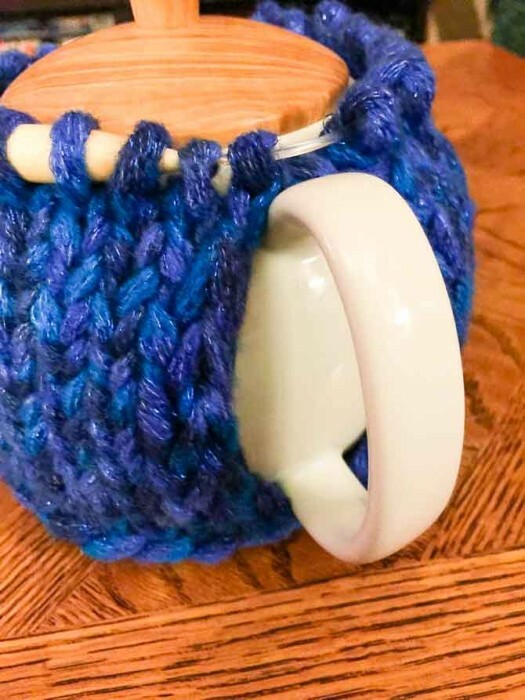 If your handle flares out a little bit, the knitted fabric will stretch over it, the only place to have to worry about is where the handle is fused to the pot. Take this measurement, mine was 3.5 inches, and knit the 15 stitches we were just working on, in stockinette stitch for 3.5 inches (or your personal measurement). Always slip the first stitch purl-wise when you’re starting a row. The other 15 stitches should be held on your circular needle cable. Once you have completed the length desired, cut your working yarn, leave a 8 inch tail. Join the working yarn to the stitches that were being held and work back and forth in the same manner for the same length on this side. The left side has all the held stitches and the right side stitches are completely finished! Just need to get the other side up to the same length and join in the round again. When both sides are the same length, it’s time to join them back into the round. 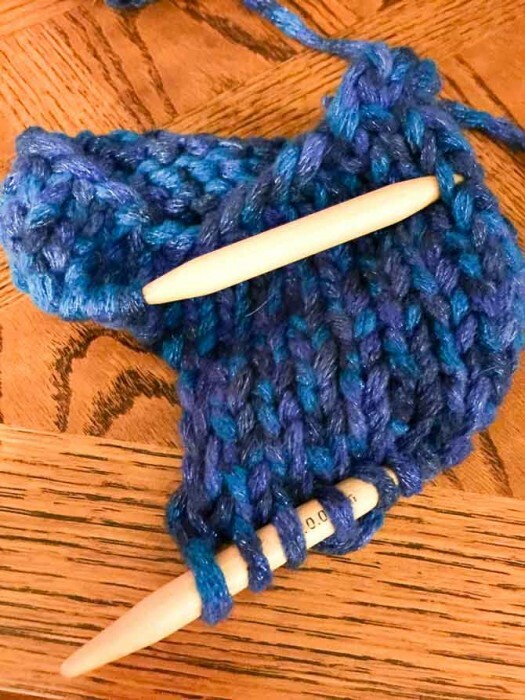 On your last knit row, stop one stitch before the end of the row and k2tog with the last stitch of this row and the first stitch on the other side of the slit. Continue knitting along the row and do the same decrease when you come to the other slit. 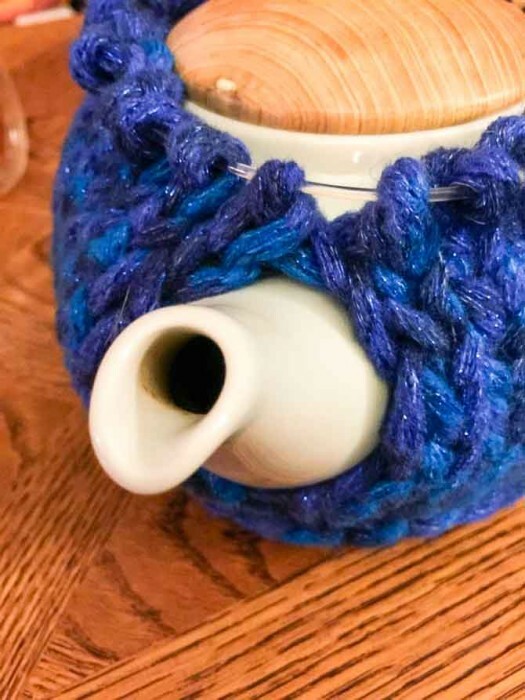 What happens after this is completely dependent on your teapot, mine ends rather quickly, but you may need to do another row if yours is slightly taller. Here are the instructions for the decreases. The opening around the spout. Row 1: *K4, k2tog* Repeat until the end of the row. Row 2: K all stitches. Row 3: *K3, k2tog* Repeat until the end of the row. Row 4: K all stitches. Row 5: *K2, k2tog* Repeat until the end of the row. Row 6: *K1, k2tog* Repeat until the end of the row. Row 7: *k2tog* Repeat until the end of the row. 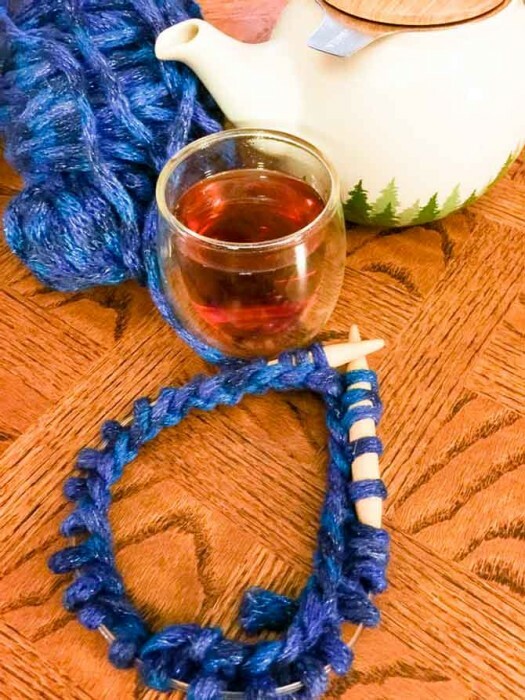 Using your tapestry needle, thread your working yarn through the live stitches and pull tight. Weave in all your ends securely. The Boutique Twilight yarn has a slight sparkle to it adding some subtle holiday cheer that would always be appropriate year-round. 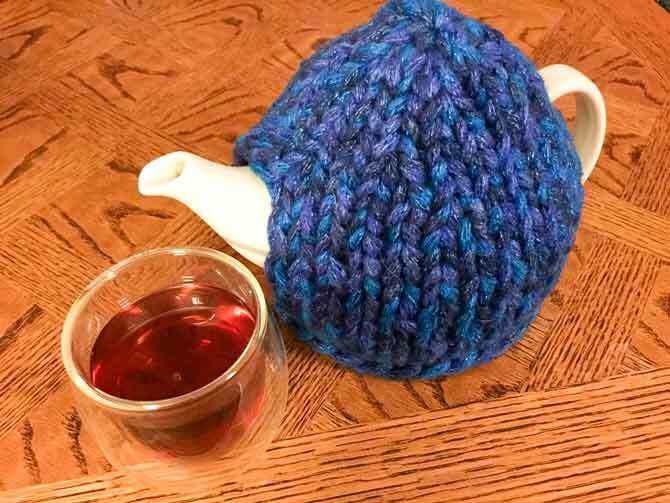 Next to the glitter of most holiday decorations this teapot cover will look right at home keeping your beverages hot and helping to fortify you against the cold weather just around the corner.